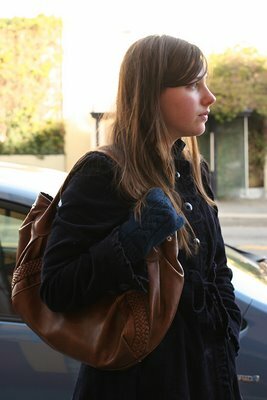 "Just stuff I see people wearing on the street." I like her blue corduroy coat and how she wears it with matching knit fingerless gloves and her dress poking out from underneath. 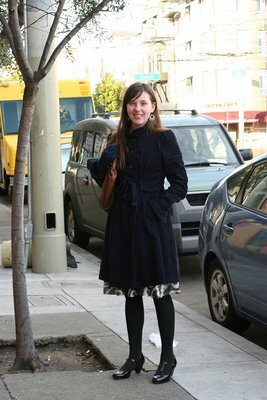 This is a great outfit for the San Francisco weather and lifestyle (layers and sensible shoes). A side view and look at her large brown tote. A look at her patent leather t-strap Mary Jane's. love those lisa t-straps. Frye rocks. I believe that specific model is still made in US. thanks meli! 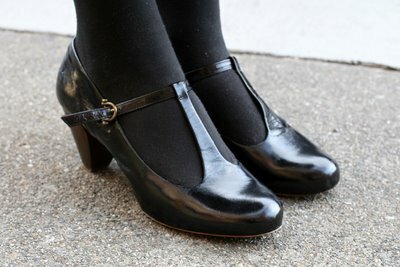 i think i like how frye looks on people's feet more than in the store windows, because i don't own a pair, but when it's mentioned that fashionist subject is wearing them -i'm like, "oh yeah - they look great!"